The month or so since the Kickstarter ended has, predictably, been busy here at TsunamiCon HQ. The first priority was collecting info from backers and working up a strategy for Kickstarter fulfillment based on our needs. There’s a lot of back-and-forth going on as we sort out details, but I think everyone involved is pretty happy with the experience and excited about the convention. The money always takes a couple weeks to show up, as well, and then there’s merch to order, flights and hotels to sort out, products and services to plan, supply caches that need to be built, and so on and so forth. To be fair, the details would get a touch boring. Suffice it to say that there’s a lot to do. While the busy work may not be all fun and games, however, the convention is exactly that! Game masters have begun submitting their initial offerings, and you can expect to see the gaming and event schedule take shape over the next several weeks. Once we reach an arbitrarily determined point of saturation on said schedule, we’ll open event registration – starting with VIGs and, soon thereafter, all registered attendees – and let you reserve seats. You’ll need to buy your badge to get “tickets” for any given game, but you’ll also save a few bucks on the badge by purchasing it in advance, so it’s a win-win. We are still actively on the hunt for exhibitors and event sponsors, so if you know anyone who might enjoy peddling their wares or purchasing sponsorships or advertising at the con, please let them know where to find us. So, two things we still need more of: Game Masters and Volunteers. Both opportunities include significant discounts on your badge. Notably, for every four hours you sign up for either duty (or combination, for that matter), you get $10 off the badge. For 12+ hours of GMing and/or volunteering at the con, your weekend pass is free. If you want to take advantage of this option, simple purchase your badge and select the appropriate discount code for your volunteer hours. You’ll see the codes listed on the screen where you add the badge to your cart. Then you’ll need to either register your games on the site before August 31st or fill out the volunteer application so that we know when you’ll be available and how you can best assist us. Please continue to spread the word and let folks know about the con. Thanks! TsunamiCon 2017 Kickstarter is LIVE! The TSUNAMICON 2017 Kickstarter is now live! Here’s a breakdown of the reward levels available. Pledge early for the best prices ever for this year’s convention tickets, swag, vendor spaces, advertising, sponsorships, etc.! T-Minus Seven Weeks to the Con! Another week down, and the convention looms ever nearer as the summer heat finally starts to give way to pleasantly warm days and cooler nights. October will be here before you know it, and with it TsunamiCon. Our focus over the past week has primarily been the event registration schedule. Over a dozen new RPGs have appeared on the site, and we’re expecting nearly as many more in the week or so. Highlights include a panoply of Shadowrun missions helmed by RPGKC Castellan Brad Kelley, a few games run by TsunamiCon management personnel, and an exciting chance to game with one of our special guests at this year’s con, game designer and scribe Casey Christofferson. You should expect to see some D&D Adventurers League hit the schedule this week, along with some Call of Cthulhu sessions, more Savage Worlds and Fate, and even No Thank You, Evil! for the kiddos. I also mentioned in a recent article that the VIG Gold package had expanded to include a couple more goodies, including a commemorative pint glass. I’ve ordered some extras to sell at the con, but the best way to ensure availability is to pick up one of our few remaining VIG tickets. Updates on the site are numerous, but subtle. A lot of cleanup and improved functionality and aesthetics on some of the landing pages. As always, if you have a question that you can’t find an answer to on the website, you can check our FAQ or drop me a line at [email protected]. Every year, TsunamiCon offers a special selection of high-end tickets for attendees who want to show their support for the con and get the most out of the experience. We call these packages VIG memberships, and they come with a few perks. These tickets package together your basic weekend pass with our standard TsunamiCon swag, the T-shirt printed with this year’s logo and sponsors and a commemorative dice puzzle emblazoned with our logo and the date, and we sweeten the deal with a dedicated “VIG Lounge” where attendees can relax, enjoy some provided refreshments throughout the day, or even get involved in some additional gaming with other VIGs away from the noise of the con. The Silver Level VIG earns the aforementioned rewards. The Gold Level VIG gets a few extras. This year, we’ve added a commemorative TsunamiCon 2016 pint glass to the gold package, as well as a $5 token for the TsunamiCon Marketplace. As a Gold-level member, you also gain access to an exclusive D&D adventure designed and run by TsunamiCon management staff. This is an adventure that has yet to be published, and you will among the first victims intrepid heroes to give it a whirl. We’ll also buy you dinner after the con on Sunday evening, where you can hang out with TsunamiCon staff, special guests, and the cast of Metagamers Anonymous. Because we order the swag and plan our exclusive games (and dinner!) based on volume, we have to limit the number of VIG tickets available. We’ll be reaching our critical mass very soon and can only offer them for a limited time, so get them now while you still can! Before I ran TsunamiCon, my experience with gaming conventions was admittedly quite limited. I had a great deal of experience organizing other kinds of large-scale events – concerts, faires, home and leisure shows, wedding and trade shows, etc. – but one of the things that drove me to start a gaming con here in Wichita was that we would often see gaming and gamers at local and regional fan conventions, but the gaming was something of an afterthought. Like a fun thing to do for geeky attendees, but all the convention did was supply the space and maybe organize someone to manage it. A game con, however, is clearly a different animal. At a fan convention, the focus is exhibitors and guests. 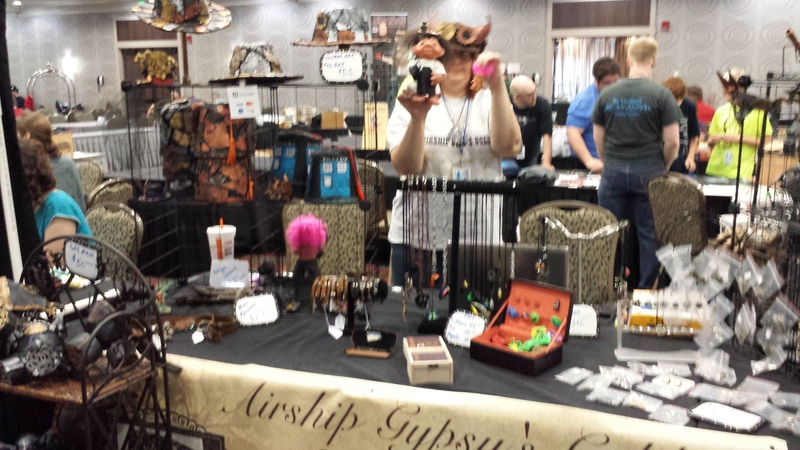 A hoppin’ con is filled to the gills with vendors, plying their trade, selling unique items and collectibles, and generally adding to the substance of the event. Oftentimes, convention organizers can even offer their space at a premium to bring in small vendors, because they are dedicating enough of their overall space to make it easy to cover the costs. A gaming convention, however, is about gaming. This presents a unique challenge… the majority of the available space absolutely must be made available for gamers who come in, sit down, and spend an entire weekend at the table. This is another huge difference in this kind of con, as most smaller fan conventions attract attendees who browse for a couple hours, maybe meet a guest or catch a panel, and otherwise are just there to socialize and/or show enjoy their cosplay craftsmanship (whereas larger fan conventions have attendees attempting to pack as many panels, autographs and photo ops into three or four days as humanly possible). So herein lies the challenge. As a merchant at a gaming convention, you have access to a fairly broad audience. But their interests are primarily oriented toward the activities at the con. So your wares, your presentation, and your salesmanship have to compliment this arrangement to be successful. Some opportunities are quite obvious… if you sell games and gaming accessories, it’s a good venue. If you sell collectibles that will appeal to gamers and genre aficionados, you’re also in good company. And if you’re a game designer, publisher, or demo team… you’re definitely in the right place. That being said, you still have to play the long game. Clearly, you get a mix of impulse buys and carefully considered selections, since they often have all weekend to decide. It can also be enterprising to make the process of interacting with you about having fun. Use dice or games of chance, have drawings and giveaways, engage passersby with the enthusiasm you have for your product or craft, and so forth. One of the advantages over a fan convention is that there are fewer exhibitors, a more select market, which virtually guarantees that almost every attendee who walks through the room will take a look at your wares and perhaps stop to visit or ask a few questions. And it’s important to note that the smaller size of the marketplace is not a detractor, as your customers are there for the gaming. It’s a unique experience, and I’ve really enjoyed getting to know our vendors over the past couple years. I am certainly pleased at the number of returning vendors, and I love seeing everything from homegrown games and handmade items to top gaming merchandise and collectibles. 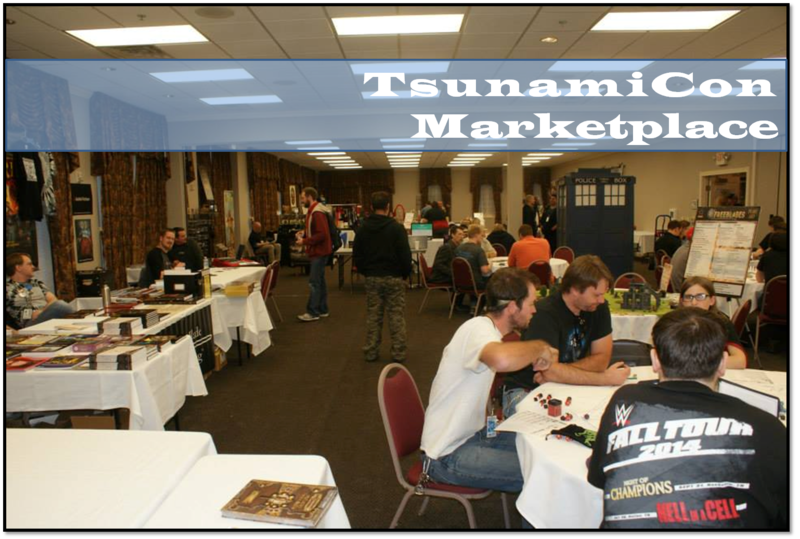 If you are interested in joining us, we still have a handful of vendor booths available for TsunamiCon 2016. Reserve your space now by pledging on our Kickstarter page. Since our very first Tsunami GameDay back in early 2013, the goal of the TsunamiCon management team has always been to spread the joy of our hobby and connect with fellow gamers. No matter how you cut it – no matter how weird or introverted or socially awkward you might be – tabletop gaming is a purely social activity, and the broader the player base, the more fun there is to be had. We have never once doubted our aspirations or that the local/regional community was worth the effort. TSUNAMICON is a labor of love. It’s a big game con, because Wichita deserves a big game con. And our experience last year showed us that the community can support it, which is what leads us today. In our first year, we approached the convention with a broad safety net. None of us are rich… we’re struggling families trying to keep our collective head above water, and we happen to love gaming. If the 2014 Kickstarter failed, we would know that there just wasn’t enough interest in supporting the event. We could be on our merry way without any significant debt… a lot of work, but very low risk. Then we had a fantastic game con. In 2015, we knew we were looking at a more expensive convention. We were forced to move to a bigger venue, and we suddenly had to pay everything up front. We broke even the first year but made no profit, so we had no choice but to run another Kickstarter. It’s a great tool, but I can’t overemphasize the amount of work involved and how stressful it is to watch the funding level crawl toward a goal it may never reach. Some people have asked what happens if the Kickstarter fails. As I write this, I still have every reason to believe we can succeed, and I hope you will help. But if we fall short… well, let me posit the two extremes of the available spectrum. Best case scenario, we find alternative funding quickly enough to put together the money for the venue (unlikely, but not impossible) and work against the clock to try to secure the rest before the con. If we haven’t paid the venue over $5K by October 20th, our contract empowers them to cancel our event. Worst case scenario… we are unable to secure quick alternative funding and the business folds. We owe a lot of money to the hotel for early cancellation and – more importantly – we have to pay back everyone who bought in early because they believed in us or were excited to do business with us again this year (or both!). It would force us to plunder any reserves we have and put our livelihoods at risk, because some portion of those early funds have been spent on things like the hotel deposit, our business license, promotional expenses like flyers and such… Let’s just say, the risk this year is significant. And to be honest, that debt would be enough to keep us from trying it again. … And it will all be absolutely worth it. I get to spend THREE SOLID DAYS surrounded by hundreds of folks having a blast because I spent all that extra time and energy, put my gamer family through the wringer, and dealt with all the stress of organizing, promoting and funding a convention. Now I need your help. Back the Kickstarter. Buy your tickets. Get the swag. Buy your friends tickets, or convince them to buy their own. We intend to do everything we possibly can to have a convention this year, and we need the support of our gaming community to make it happen. No hyperbole… no dodging the question. We. Need. You. It’s our convention… yours and mine. And this is how we make it happen.